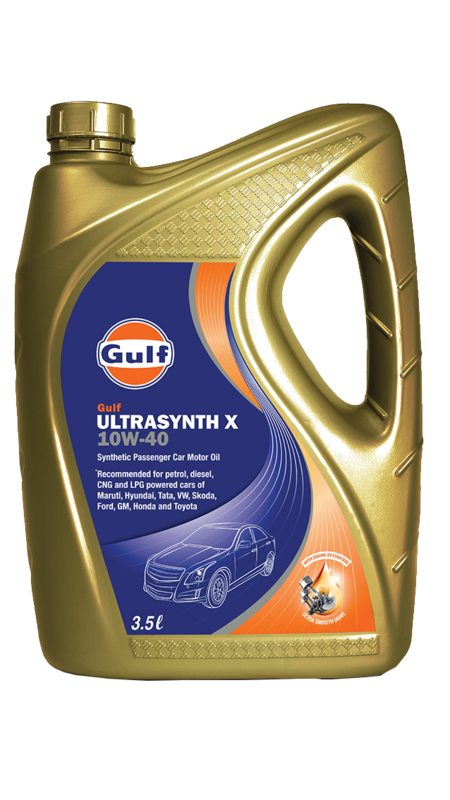 Gulf UltraSynth X 10W-40 - Gulf Oil Lubricants India Ltd. Synthetic car engine oil for premium hatchbacks and mid-size & executive sedans. Gulf Ultrasynth X 10W-40 is a synthetic passenger car motor oil specially developed for modern petrol, diesel, CNG and LPG engines. It is formulated with special engine detoxifiers in premium base oils that protect the engine from harmful carbon deposits in all types of conditions. ‘Cold running deposits’ formed during city driving and ‘hot running deposits’ formed during highway driving conditions are arrested by these detoxifiers, thereby keeping the engine clean. The ‘detoxed’ engine is more responsive and delivers an ultra smooth drive.